My thanks to David McCambley who has provided much information about the photos on this page. Alan Agnew has also helpfully provided some of the gaps in names too as has Rodney Boyd. All the pictures seem to be from the same roll of film except possibly the last photo of a group of girls. The fourth picture shows the soccer team and fifth picture some instrumentalists. If you know anything or can name anybody in these photos contact us. Orchestra, Football, P.7 pictures listed. 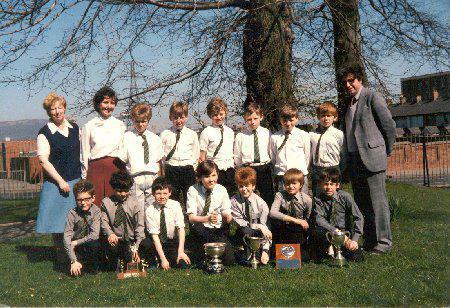 Above : Football team from back left is Neill Whiteside, Jim Jones, Gary Clarke, Alan Agnew, Philip McKeag, unknown, John Clarke. 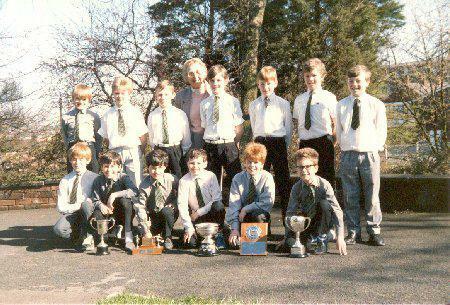 Front from left Grahmers (don't know other details), 2 x unknown, Alan Agnew, Glenn Docherty, Neill Whiteside, Unknown. 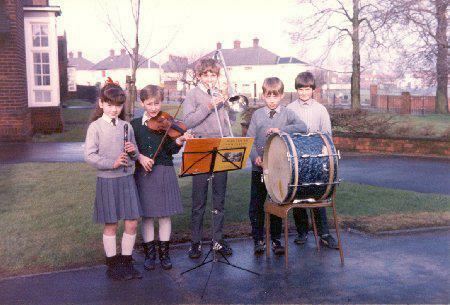 Thanks to Pamela Coates for emailing the detials for the above photo. 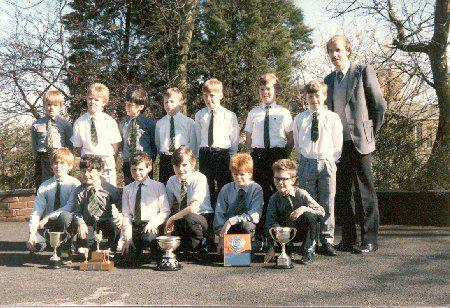 Above : Back Row (L - R) Ryan Taylor, ? ?, Samuel Kell, ? 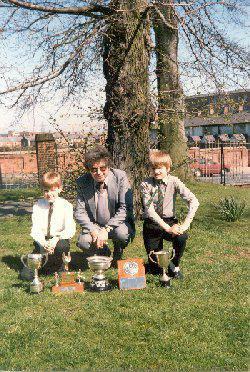 ?, Stuart McDowell, ??, ? ?, ?? Front Row (L - R) ? ?, Leslie McAlese, Keith McWilliams, Mark Thompson, ??, ? ?, David Isaacs, ?? 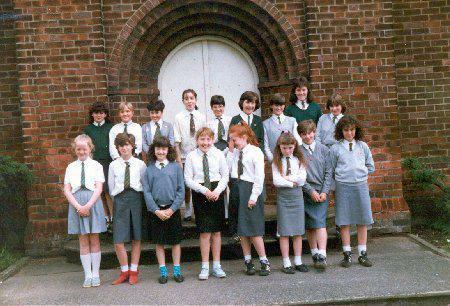 Above : Front Row (L-R) Nicola McCulley, 5th girl is Jayne Campbell, 6th girl is Pamela Coates and 7th girl is Nicola Smyth. Back Row (L-R) Jennifer Leslie, Emma Scott, 6th is Lisa Hoey and 7th is Alison Hodge. 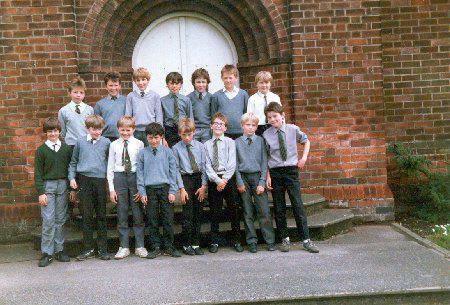 Thanks to Karen Coates (now Chrimes) for the information on the above two photos. The last picture with Mr. Simpson has Philip McKeag left and Neill Whiteside right.